Button Bonanza – Clearance Event! Select styles of buttons are marked down 30%! 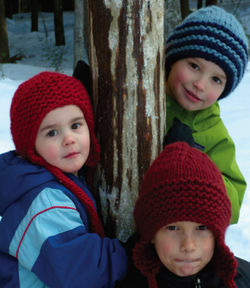 Give your sweaters a makeover with new buttons or embellish hats, mittens and cowls. These will go fast – we recommend calling in your order at 1-800-341-0282. No additional discounts, returns or back orders. 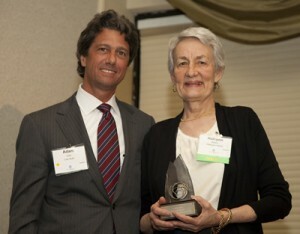 We’re happy to announce that Halcyon Yarn & our President Halcyon Blake have just received the Shep Lee Award for Community Service from the Maine Institute for Family Business! We’re celebrating by giving 10% of next Monday’s (May 23rd) sales back to community organizations in Bath. For every purchase you make that day we will donating 5% to Main Street Bath and another 5% to the Bath Youth Meetinghouse. When you shop at Halcyon Yarn, you can feel good knowing that you are supporting an independent family owned business with a proven commitment to community service as well as customer service. One of Halcyon’s greatest joys and accomplishments at Halcyon Yarn is her continuous commitment to social responsibility both personally and as a businesswoman. At the award ceremony in Portland this week Halcyon acknowledged the wonderful community of independent businesses here in Maine and offered heartfelt thanks to her staff and community for helping make it possible for her to do what she loves. During her forty years in business she has volunteered countless hours to many non-profit community organizations, donated generously and encouraged her employees and family to do the same. Halcyon Yarn also pays staff their regular wages for a set amount of community service time each each month so that employees can contribute their time and skills to the organizations they care most about. Halcyon has built a terrific business not just by providing terrific customer service and also by providing service to her community. She believes that strong communities and strong relationships are good for each of us and good for business. 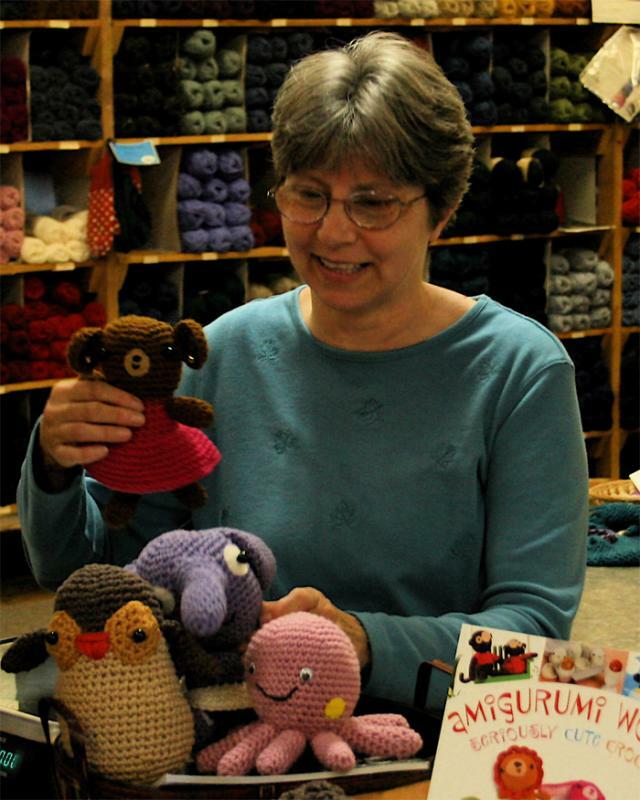 Many of you have talked with her over the phone or in the shop over the years and you know you can always count on her expert advice and encouraging words – this passion for service is as authentic here in Bath and throughout Maine as it is in the fiber arts community. Operating Halcyon Yarn is never “just a job,” instead it is a wonderful place to forge relationships and a vehicle for creating positive change in the lives of those around her. 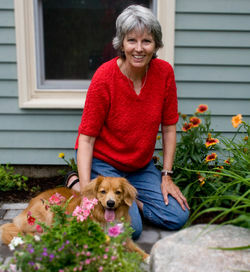 This month’s staff profile is Susan Upham. 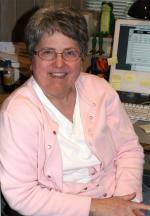 Now, just what does Susan do here at Halcyon Yarn? It might be better to say “What doesn’t Susan do here?”. Her official title is Operations Manager, and she’s the cog that keeps this place moving. 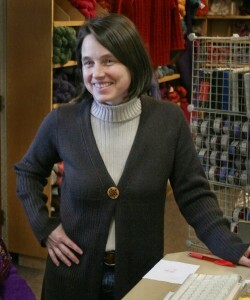 After nearly 13 years here at Halcyon Yarn, there isn’t a job she hasn’t done. Before Halcyon Yarn, she worked at Jagger Brothers Inc., a custom yarn producer located in Springvale, Maine. Being a Mainer, born and bred, her work ethic is second to none. In fact, if it weren’t for needing to take her adorable dog, Tessa, (seen in the photo with her) for a walk, she’d never stop working. Thank goodness Tessa is a constant companion who faithfully accompanies Susan to work each and everyday. She’s a wonderful retreat when life and work get hectic. Susan’s primary responsibility is purchasing and her so called secondary responsibilities are too many to list. She oversees everything and helps out whenever and wherever needed. Many of you have probably spoken with Susan, as she can also be found taking phone orders or helping customers in the shop. In case you might be thinking Susan is all work and no play, let us put your worries to rest. She and her husband, Jim, (Bath’s very own City Planner), are avid sailors who make good use of our beautiful Maine coastline. Come summer there’s nary a weekend you’ll find them on dry land. And what of the weekends during the rest of the year? Well, when family is a priority, and you have four wonderful and active grandchildren near by, there’s never a dull moment. Of course, she still has to work in a moment or two for a little knitting and culinary expression. Having twin granddaughters gives her a great excuse to knit some really cute items. She might be more inclined to knit for Jim if it weren’t for his favorite color, orange! However, what Jim lacks for in knitted attire, Susan more than makes up for in the kitchen. She’s a great cook who keeps him well fed. We’d like to introduce you to a long time employee, Kendra Rafford, who we’re welcoming back to Halcyon Yarn. Kendra started working here years ago. 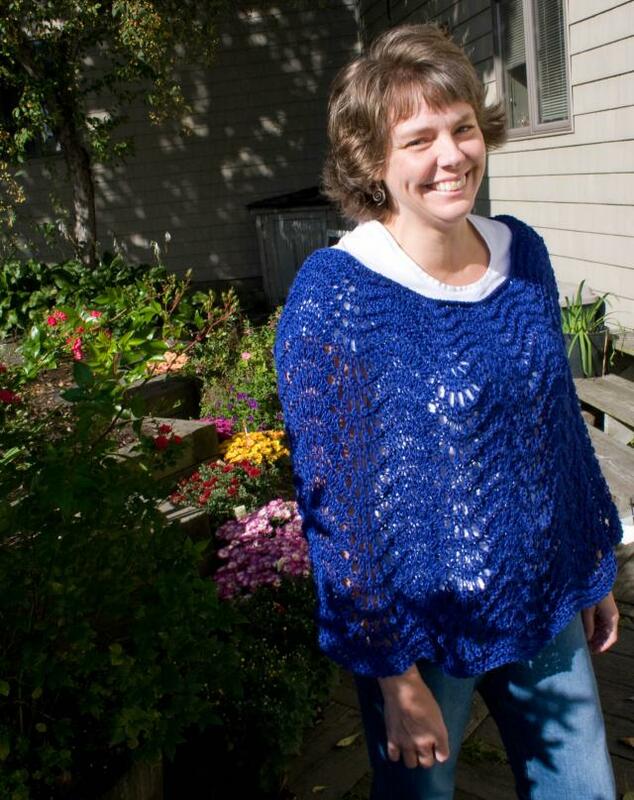 She often says Halcyon Yarn was the spark that ignited her love of the fiber arts. And oh what a fire it’s created… Being a creative and tactile person she loved being surrounded by all the colors and fiber. If there was a class, she wanted to take it. If there was a book, she wanted to read it. 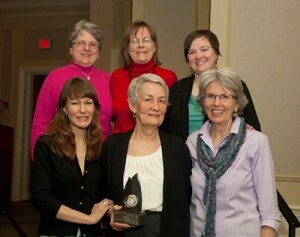 Years later she is an accomplished fiber artist who creates patterns, knits, spins, weaves and specializes in felting. 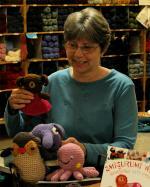 Trained as a teacher, she loves to help customers and introduce them to the fiber arts she loves. So don’t hesitate to ask her a question or sign-up for one of her classes. As her fiber skills and acquisition of knowledge grew, so did her family. Once single, while at Halcyon Yarn we watched as she married and welcomed one, then two and finally 3 little boys into her life. Many of our long time customers may remember Trevor, her first son, who was often seen amongst the yarn and fiber on a daily basis. Oh how we love yarn and babies here at Halcyon Yarn. Trevor was only one of many babies that got their start here at Halcyon Yarn, Halcyon’s own daughter Gretchen being the first. But that’s a story for another day. With the arrival of her third little boy, she took a few years off to concentrate on taking care of them and creating her own one of a kind creations. Well now she’s back, at least on a limited basis. She’ll be joining us at the shop every Tuesday and doing some designing from home. She still has those fetching young fellows, who can be seen in our new pattern “The Family Favorite Hat“, but they are old enough now for her to sneak away for at least one day of fiber fun. We’re glad to have her back and we hope you are too. For many of us, knitting has many mysteries, and when we encounter them we run for a pattern, phone a friend, or put the project in the “finish it later” pile…. Not so for Gwynn, for her that is where the adventure begins. She is one of those rare folks who’ll have a great idea leaving work in the afternoon, and come in the next day with a designed-from-scratch must-have-marvel. Does that type of designing sound spontaneous? Well that’s Gwynn. 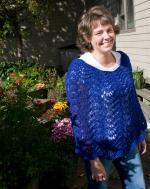 After moving here from Albuquerque, NM “just because!”, she has been working for Halcyon Yarn since ’06. Gwynn’s responsibilities for us include sales, scouting new yarns, patterns, and colors, lending a hand where needed (hey, small company, we all work outside our job description), and designing. Gwynn also occasionally delights the staff with a visit from her 4.5 year old daughter, Meredith, who is showing signs of an inclination toward design: Case in point, we’ve heard rumors of paparazzi photos circulating showing Gwynn wearing a Meredith designed “Spaghetti & Pipe Cleaner” bracelet. Tres, tres chic. While Meredith, knitting, and designing keep Gwynn busy, she also finds time to read fiction (Harry Potter, oh yeah! ), and, you guessed it, reading knitting books. Gwynn confesses to an obsession with sock knitting, perhaps to cleanse her palate after her latest design project. Unfortunately for most of you who don’t work at Halcyon Yarn, you’ll miss out on many of Gwynn’s prolific works. Fortunately, a bunch have made it through the extensive writing/testing process and onto our website (check out her patterns that are available online here) and into our catalog. You may notice that the most recent catalog cover shot features the Graceful Ribbed Cardigan, a sweater that was knit and designed by Gwynn. This, her most recent work, almost caused a riot in the store as folks lined up to try it on — it’s one of those designs that really just looks good on everyone, and makes everyone look good. When asked about her plans for the future, Gwynn had no hesitation about priorities: “Raise a happy healthy daughter, and knit socks” she quipped. Thanks Gwynn and Keep up the good work! The Man, the Myth, the Legend: Michael Patterson. A living legend, that’s this month’s staff feature: Michael Patterson, our beloved and long time instructor! Michael has been teaching classes since the mid 1990’s for us, and as such has a loyal following. It’s always fun to see his classes in action – who knew that weaving could be such a raucous and boisterous pass time?!?! Michael has been in the area for ages now, having moved here with Margaret (wife), and Joshua (son), in ’75. He’s established strong ties. Mike’s first career was as an RN in intensive/emergency care. Wow you say, how do you transfer from that high intensity environment to the weaving studio (his current occupation)? 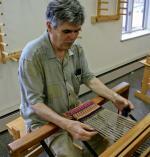 “Actually, I started weaving while working in intensive care; it was a great non-stress activity” says Michael. Before opening his current studio, he also worked full time at Halcyon Yarn for several years. While Margaret keeps after Michael to keep up with his chores (“when are you going to weave me that yardage I need for my sewing project! ), Joshua is just as happy to leave his fiber ties untended (“Joshua has limited his ‘fiber’ history to having a small flock of Montadale sheep while in the 4H” says Mike). 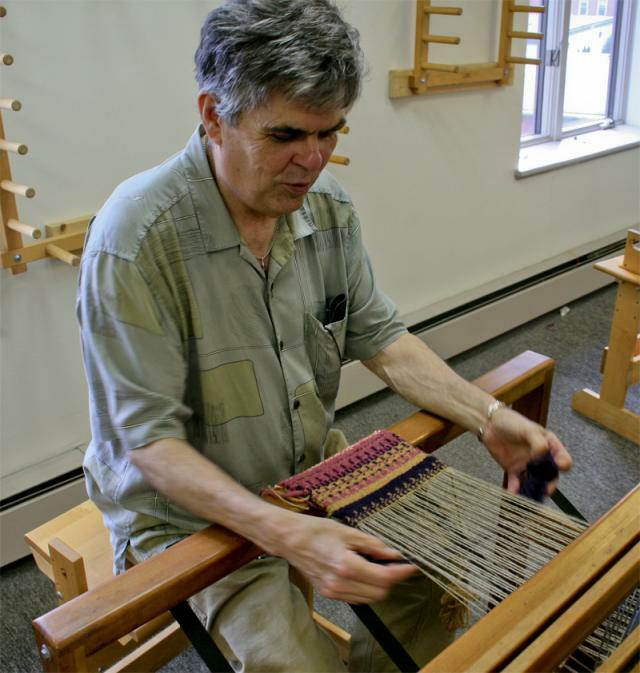 Michael is more than just a master weaver too – interested in a course in spinning, dyeing, or Kumihimo? He’s your man, able to explain time tested techniques and cutting edge experiments with equal parts skill and humor. Outside of weaving, Michael enjoys “music and ADHD style internet surfing”. Luckily for us he frequently finds time to stop by Halcyon Yarn outside of classes too – A great opportunity for us to try to “stump the master” with anything weaving related… Though, truth be told, we haven’t succeeded in stumping him yet! Be sure to keep an eye on the classes page, and sign up for one of his great classes! Also, keep an eye out as we develop a series of online video tutorials with Michael… More to come soon! Ever wonder who put together the beautiful sample card you just received? How about that kit you just ordered? Well, all of the Halcyon Yarn kits and sample cards are made right here, and most are made by Annalee. She helps Halcyon Yarn to keep offering the important, informative, and generally awesome sample cards – and, without her we also couldn’t offer the wide range of creative kits designed by local artists. Annalee started here in September of 2007. While she’s not a “native Mainer” (hey, neither are people who were born here unless their great-great grandparents were also! ), she been a local for quite some time: She moved from New York state in 1999. When first asked about being featured for the staff highlight she said “Oh, no, really? Everyone here is so talented with crafts and knits so beautifully, I have a lot of catching up to do”… Hmm, we’ll see about that. It turns out that Annalee started crocheting in college. 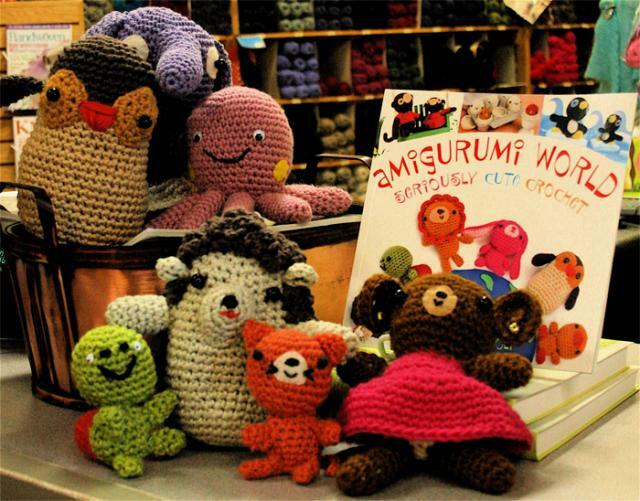 Though she hadn’t been actively crocheting when she started at Halcyon Yarn, she offered to hook up some samples from “Amigurumi World” for the store… Wow! Talk about bringing things to life, the adorable samples are a hit amongst kids and adults alike, and we can’t keep the display orderly as a result! Is that it for Annalee’s fiber interests? “I also enjoy embroidery, sewing and cross stitch… And I’m learning to knit since coming to Halcyon Yarn”… Whoa, watch out! Outside of work and the fiber arts Annalee has two cats, Maya and Tess, and two daughters, Megan and Julie. She enjoys gardening and reading, and is a BIG NASCAR fan! And, she likes to head even farther north (or, east) for holidays and vacations to spend time with family in Nova Scotia. “You may call me a relic” says Peggy, laughing. Since she’s been with Halcyon Yarn for 20 years, her jest is understandable. But the truth is, she has her hand on the pulse of the fiber world as well as that of Halcyon Yarn and she is about as current as they come. What has/does Peggy do at Halcyon Yarn? “I have done most aspects of the business, shipping, packing, taking orders…”, it’s a long list and makes an exact job description tricky. But chances are, if you have a question to ask, she’s a good place to start (for customers or staff!). On the off chance she doesn’t know, she’ll know who will. With all that experience, one wonders how the place has changed… “We have expanded a lot over the years, from only being open to instore people 2 hours per week to 6 days a week with Sundays off for good behavior” jokes Peggy. But it’s true, with the move to an historic warehouse in Bath, Maine, Halcyon Yarn has become something of a “destination store” with visitors from all over the world – to say nothing of the orders coming in from cyberspace around the clock. And this evolution has been helped along by Peggy’s knowledge and humor. Peggy’s fiber arts interests are diverse, and she’s amenable to their proud tradition: “I like to do rug hooking, and have made sweaters for each of my grandchildren”, she says. That’s where you begin to realize that she’s a Mainer – blending tradition, ingenuity, and no fear of tackling a project. “If you talk to me on over the phone you can tell I’ve lived in Maine all my life, I have the accent” she said, and she’s got the laugh too – Thanks Peggy for keeping things bright and us productive! You are currently browsing the archives for the Staff category.